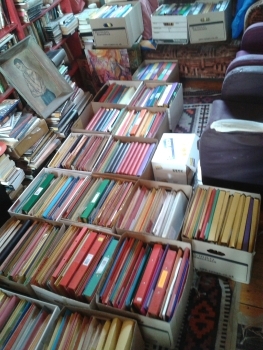 My relationship with Russell Hoban began a little like one of his novels might: in a disordered room in Fulham, piled high with boxes and files. Anyone who has ever seen the inside of Russell's inner sanctum knows that it's like stepping into his mind. Suddenly you're surrounded by all of the motifs that he wove again and again, with a composer's persistence, into his work: sculptures of lions lounge on every shelf and surface, a cackling Punch puppet sits on the mantelpiece, and an antique poster for the premiere of King Kong lies rolled up on the desk. An enormous map of Kent fills one whole wall, and books are piled in shelves that reach to the ceiling. have never been inside a room that so achingly missed its owner. When I was asked to build an archive of Hoban's work, I agreed without knowing much about him. I'd read his cult masterpiece Riddley Walker some years before, and a short story of his, Message in a Klein Bottle, that was published by the Guardian shortly after his death in late 2011. That was all, though - and the name hadn't stuck in my memory. Before beginning to sort through all the piles of papers and manuscripts that would occupy me for the next four months, I decided to read as many of his books as possible. I found Hoban's novels hard going at first, but it didn't take long for him to win me over with his weird and idiosyncratic style. I found his writing to have more in common with music than with other prose: more than mere mimicry of life, his work is a symphonic arrangement of signs and symbols, so that the more you read, the richer your engagement becomes. When I got to the manuscripts themselves, what I found was perhaps even more interesting: endless drafts and redrafts of novels and short stories, with perplexing codenames like "Krokne1" and "OwlWo4", all printed in serif font on bright yellow paper. Hoban was prolific, and often wrote entire redrafts over a period of days. He worked intensely for short bursts, sprinting out four or five new versions in a fit of excitement that could last for weeks before slumping into inactivity for a month on end, or even throwing a project aside and coming back to it only years later. He was an incorrigible perfectionist, and his dedication paid off. If you listed each of Hoban's books by order of the number of drafts he attempted, you would have a fairly accurate ranking of the books' eventual success. Two cases in point are Riddley Walker and The Mouse and His Child, both of which went through almost endless permutations and enjoyed tremendous popularity. Riddley Walker, arguably the most successful and acclaimed of the two, was also his most reworked, with the archived collection running to over 50 items. The novel is rightly famous for its depiction of a post-apocalyptic English degraded by centuries of entropy following the fall of civilisation. The corrupted language of the novel feels so organic partly because it is: Hoban started out writing in plain English, only to have the work find its true voice as he drafted and redrafted. He watched the language rust like iron before his eyes. One thing more than anything else made me respect him: at one point, with a 500-page manuscript of Riddley Walker ready to go, Hoban pulled the plug, scrapped the whole project and started again, from the beginning. Due to this single-mindedness, Hoban was uncompromising with editors, and often exasperated with the changes they made to his carefully-crafted work. Even with his short children's books like Bedtime for Frances or Jim Hedgehog's Supernatural Christmas - which some might consider a sideline to his novels - Hoban took the craft of them deeply seriously, and was at pains to explain to editors exactly why a particular word or reference had been placed in the text. He never patronised children, and fought for some of the more "grown up" themes in his children's books to remain: the references to jazz musicians in the unpublished Jim Hedgehog's Midnight Saxophone, for instance. Reading through the rest of his letters, you get the sense of a man of contrasting poles, who could fly in and out of tempestuous moods. One side of him was full of warmth. He would think nothing of typing 10-page letters to friends on both sides of the Atlantic, or engaging in long correspondences with fans and admirers about psychology, music or film. He promoted children's literature in schools and championed the value of stories. The other side was a man who felt it his duty to protect his art against the forces conspiring against it. Hoban was perfectly capable of raging at those he deemed incompetent or malicious. He didn't tolerate poor craft, and once snapped at an editor that the man's "chimp of a typist" had completely riddled a manuscript with errors. The scriptwriters for the animated film adaptation of The Mouse and His Child suffered similar ire over cuts made to the narrative: "the fact that you have removed this entirely necessary part of the story exposes how little you understand about my work," Hoban once told them in a letter burning with anger, sadness and frustration. It's hard, when archiving, to keep your eye on the significance of the work you're doing. It's easy to fall into mindlessness, simply marking and numbering each item and adding it to the catalogue, numbering the boxes, noting down the correspondents - and all the while, you forget that what you're handling is the accumulation of a man's life, and a great artist's work. Certain moments shock you out of complacency, like finding an invitation to the White House from Barbara Bush in 1991, or a letter signed "Harold P" in looping, ostentatious handwriting (Pinter wrote the Turtle Diary screenplay). It's these instances that remind me how lucky I was to be brought so far into the world of a man who has touched the lives of so many, who has delighted so many readers. A man who I will never meet. Photos (c) Paul Cooper. 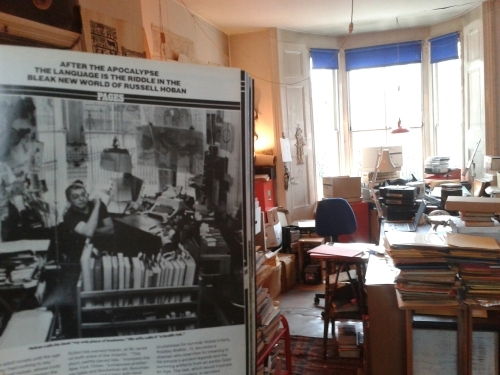 The top photo shows Russell Hoban's workroom in December 2013 with, in the foreground, an original 1981 "People" interview featuring a photo of Hoban in the same room. The bottom photo shows some of the archives. Paul Cooper is a writer and journalist from Cardiff. He graduated from the University of Warwick in 2011 and went on to study on the Creative Writing MA at the University of East Anglia. Between spells teaching English in Sri Lanka, working in a bookshop in Santorini and undertaking placements at literary magazines, Paul works as an archivist and freelance book reviewer. His debut novel River of Ink is due to be published by Bloomsbury in 2015.